Mike along with his brother and dad recently took delivery of a new Riverhawk Pro Cuddy 24 that they were nice enough to bring me for bottom painting. These are really well built boats I came to realize after spending a week working on it and I'd recommend anyone shopping for something like this ought to check them out. I believe Cabela's are the dealers for these. 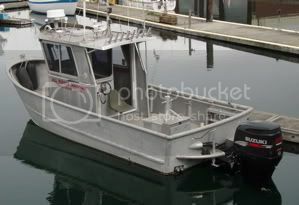 Alloy decks, a really nice self bailing system, 1/4" bottom, great looking welding, fit & finish entire boat is excellent. Good buy there Mike! Thanks Bob! We are happy with the boat and we will be putting it to the test next week at Neah Bay. I am looking forward to my first post in fishing your alloy boat.